Chickasaw National Recreation Area in Oklahoma was originally established in 1902, but it was reformed and redesignated multiple times before taking on its current incarnation. It preserves some of the most forested regions of the state, and provides an example of Civilian Conservation Corps design at its best. Today, the 2011 5 oz. Silver ATB Chickasaw coin is available on Silver.com in near-perfect condition. Fifth release in 2011 and tenth overall in the ATB Series. Ships to you in a protective plastic slab by the NGC. Issued a face value of $.25 (USD) by the United States government. Bears a grade of Mint State 69 from the Numismatic Guaranty Corporation. Honors the state of Oklahoma in the ATB Series. Commemorates Chickasaw National Recreation Area. America the Beautiful is a 56-coin series that honors the national parks, forests, monuments, and historical moments in American history. The series launched in 2010 with the first five coins of the series, and features five new designs each year. Scheduled to run through 2021, the Secretary of the Treasury has the power to extend the program if necessary through 2033. The 2011 5 oz Silver ATB Chickasaw coins in this product listing have MS69 grades from the NGC. Each one exhibits its full, original luster from the mint, as well as a maximum of two minor detracting flaws. These flaws are limited to minuscule features and found only outside the primary focal areas of the coin. 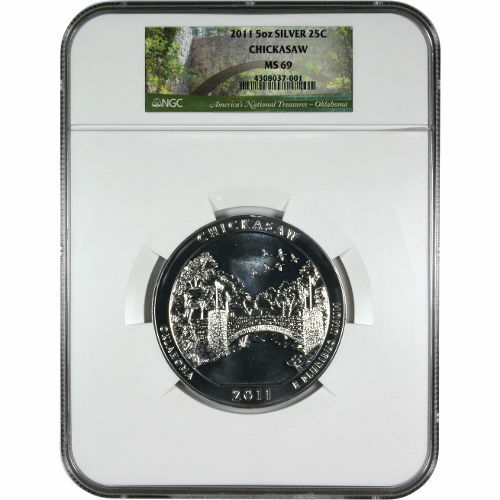 On the reverse of all 2011 ATB Chickasaw coin is the image of a bridge over Travertine Creek, along with engravings of the park’s name, state of issue, and the year of issue for the coin. The obverse face of the coin is graced by the left-profile portrait of the nation’s first president, George Washington. It was created by John Flanagan in 1932, and based upon an original sculpture from William Cousins in 1786. If you have any questions about the 2011 5 oz Silver ATB Chickasaw coin, you should feel free to contact Silver.com. You can reach us on the phone at 888-989-7223, online using our live web chat, and via our email address. 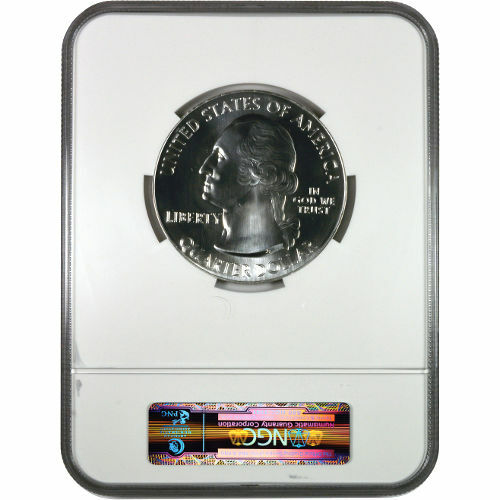 If you are interested in similar products, check out the Certified America the Beautiful Coins page.